Denne uge markerer Norwegian de første flyvninger mellem London og USA. Onsdag afgik første fly fra London Gatwick til Los Angeles, mens første flyvning til New York afgik her til eftermiddag. På fredag flyver Norwegian første gang mellem London og Fort Lauderdale. Alle flyvninger er næsten fulde. 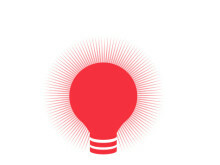 This week Norwegian celebrates its first ever flights between the U.S. and London Gatwick. 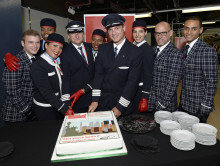 Wednesday evening, the first flight between Los Angeles and London Gatwick took off, while Norwegian’s first flight between New York’s Kennedy Airport and London took off this evening. Friday evening, the airline celebrates its inaugural flight from Fort Lauderdale to London. All the flights are almost full. 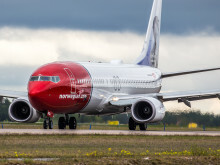 This week Norwegian celebrates its first ever flights between London Gatwick and the U.S. On Wednesday afternoon, the first flight between London Gatwick and Los Angeles took off, while Norwegian’s first flight between London and New York took off this evening. Friday afternoon, the airline celebrates its inaugural flight to Fort Lauderdale. All the flights are almost full. Denne uken markerer Norwegian de første flygningene mellom London og USA. Onsdag var første avgang fra London Gatwick til Los Angeles, mens første flygning til New York tok av torsdag ettermiddag. På fredag flyr Norwegian for første gang mellom London og Fort Lauderdale. Alle flygningene er nesten fulle.